One of the things my family counts on each and every single day, is a good home cooked meal. That can get pricey so I LOVE to create Budget Friendly Meals. The other day they weren’t too terribly concerned with how busy I was during the day…they just wanted food! So I’ve spent many years creating super easy nutritious meals. I have several Easy frozen hamburger patty recipes and they are deelish! 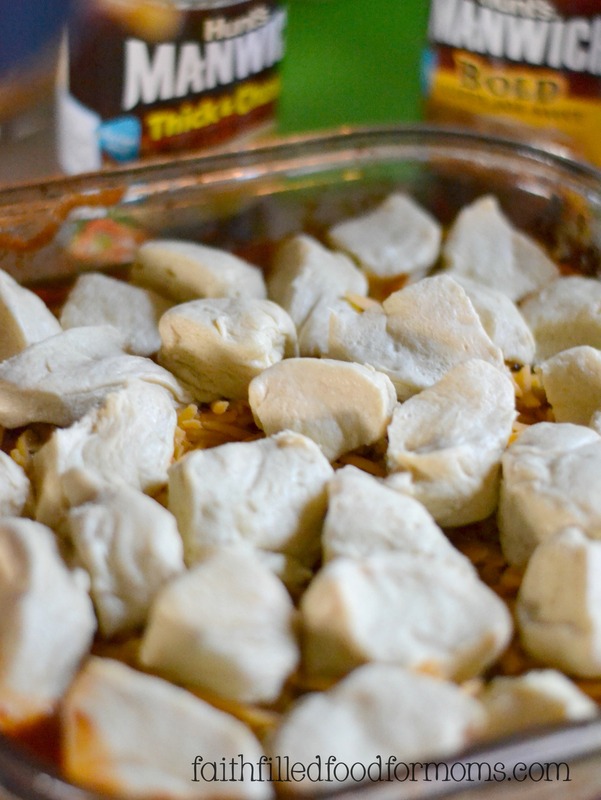 1 This Cheesy Sloppy Joe Casserole with frozen burgers is one of them! 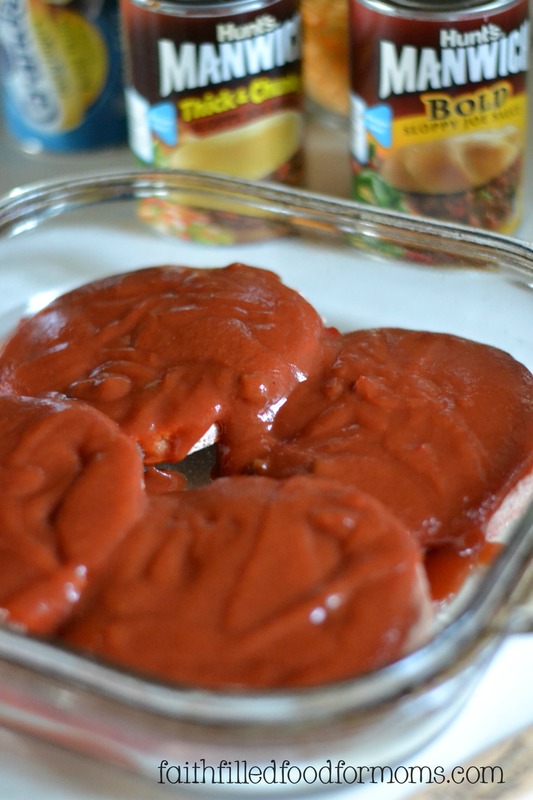 5 Or maybe you would love more Frozen Burger Recipes! This Cheesy Sloppy Joe Casserole with frozen burgers is one of them! I truly believe that it’s sooo important to have good healthy meals and snacks throughout each day to keep strong and healthy bodies going. Here’s the thing…I simply get tired. It’s exhausting cooking so much each and every day, especially after a busy weekend. I created this super easy Cheesy Sloppy Joe Casserole using Hunt’s Manwich Sloppy Joe sauce and oooh how the fam. loved it! Hunt’s Sloppy Joe Sauce also has 2 new flavors, Thick and Chunky and Bold! YUM! Did you know that National Sloppy Joe Day is March 18?! 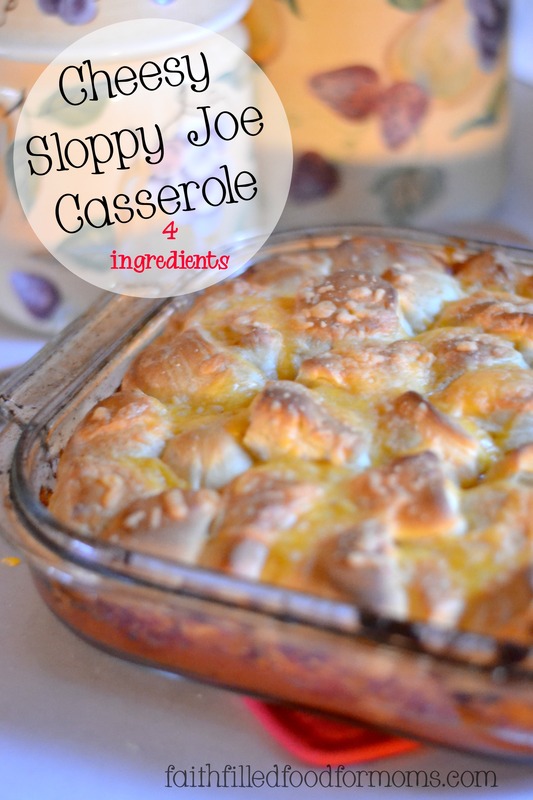 Yep it is…so get your Sloppy on and make something wonderful and easy! Then pour 1 to 2 cans of Hunt’s Manwich Sloppy Joe Sauce over your Frozen Burgers. Cover with foil and cook at 400 degrees for 20 minutes. While burgers are cooking, cut up biscuits into fourths. Add biscuits and top with cheese. Cook an additional 15 to 20 minutes or until biscuits are cooked and golden brown. That’s it! Not only does this Cheesy Sloppy Joe Casserole have only 4 ingredients, it’s ready in 35 – 40 minutes! This easy Cheesy Sloppy Joe Casserole recipe with Frozen Burgers has under 5 ingredients and tastes delicious! A super kid friendly meal for the whole family! 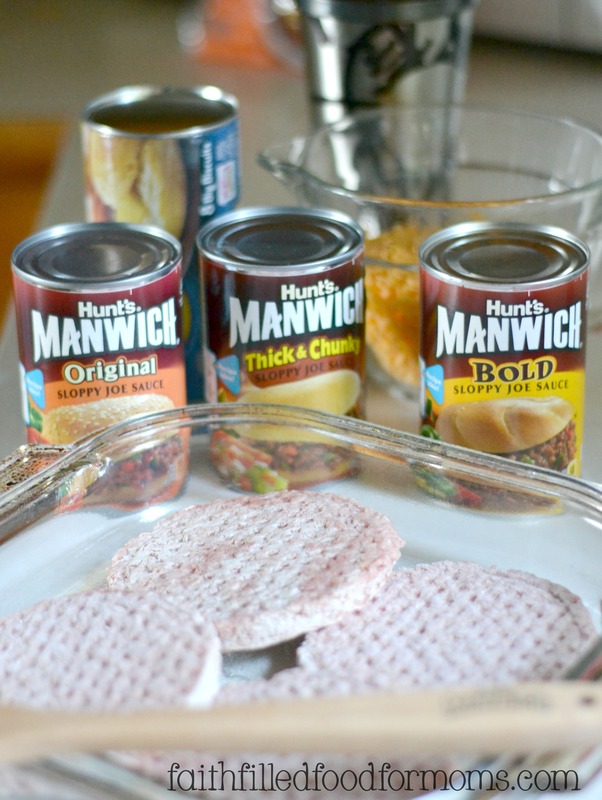 1 – 2 Cans Hunt’s Manwich Sloppy Joe Sauce Use any of the 3 yummy flavors! 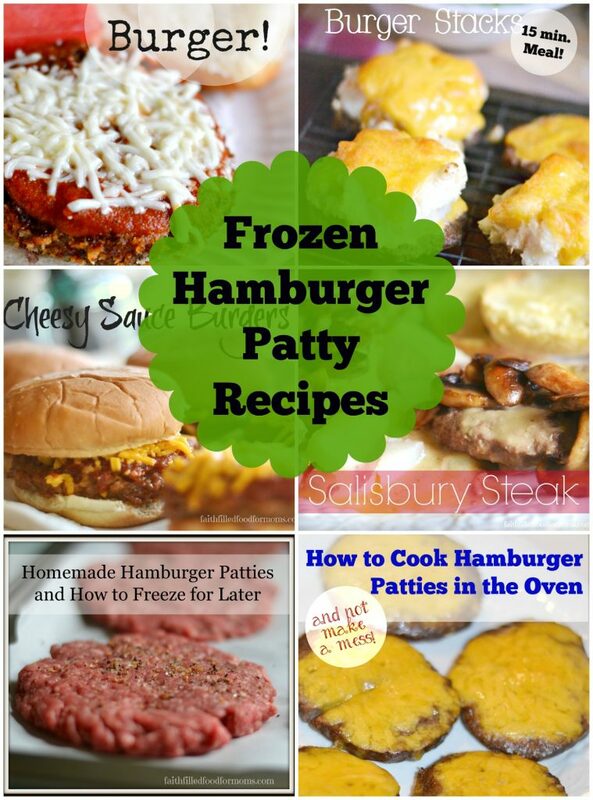 Or maybe you would love more Frozen Burger Recipes! You had me at “sloppy joe”. 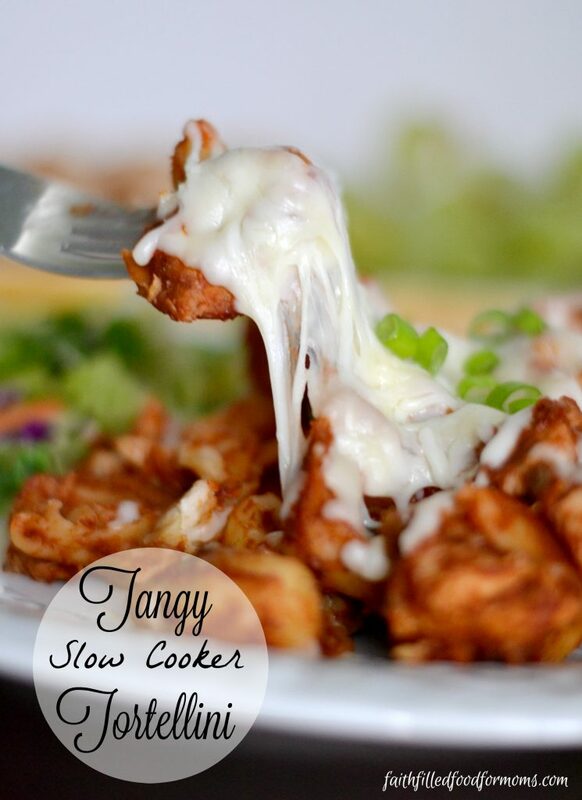 This looks like the perfect, easy dish that I love! Thanks for sharing it! Found your blog through the Blogalina Link Up. This looks yummy! I punned it and it will have to get a spot in the rotation. 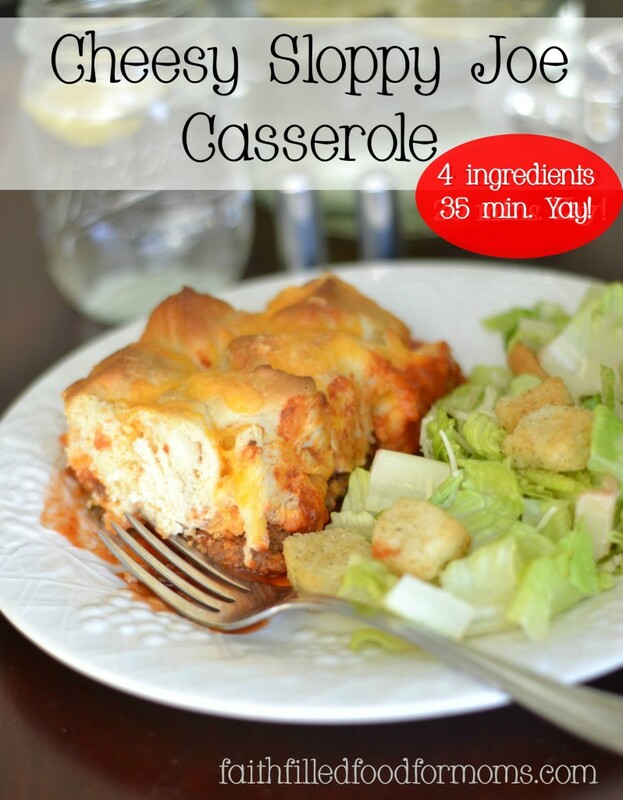 What a great casserole and I can’t wait to try it! Happy St. Patrick’s Day and thanks so much for sharing with Full Plate Thursday! This looks great. I was wondering how to use some frozen hamburger patties in my freezer. I didn’t have any Sloppy Joe Sauce so I used regular Pasta Sauce and added brown sugar, garlic, Worcestershire Sauce and tomato paste. Really good!! On another subject: I fully understand the need to have advertising on your website. It’s how you finance having a website and make some money – hopefully. I DO look at the ads because there are a lot of “goodies” there that I might not have thought about. However, I draw the line at pop-ups that suddenly appear while I am reading and block me from seeing anything at all. It breaks my concentration and is very frustrating. I feel that it is as rude as interrupting someone who is talking. I usually don’t come back to sites that repeatedly get in my face. Just some “food” for thought. You can take it or leave it – – – and so can I. 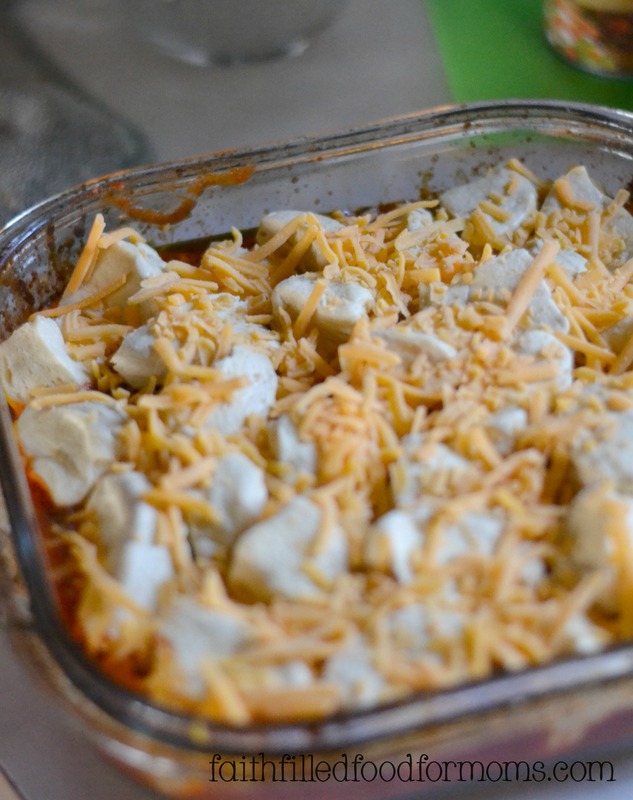 Love this, but when I tried it, the meat was totally raw and the biscuits only cooked on top. I am so sorry to hear about this! Hmm I’m wondering if you had the temp right? Also sometimes oven temps vary..or was the oven pre heated first? Sometimes if it looks like my biscuits are going to be done before cooking time, I will put foil over the top so they don’t burn or cook to fast. I’m not sure of any other reason. Many have enjoyed this easy meal 🙁 If you try it again I would love to know what you may have done different. I soo appreciate you communicating this to me. Have a blessed week! Could you do this recipe with already cooked dinner rolls? Hi Hannah! Sure, I think you could do this with already cooked rolls. I would only put them on at the very end of your cooking time, like last 5-8 minutes and watch carefully so they don’t burn. 🙂 You could put foil over them to make sure they don’t burn.